With the little inconvenience of Christmas out of the way (mince pies vs training, it’s always hard! ), the North West league kicked back into action last weekend over at Macclesfield, with the ‘Supacross’. Last year’s course was good, this one’s was even better – a nice mix of fast straights, sweeping and sharp corners, some surprisngly ard uphill drags and a few lovely off camber sections to get those tyres working. The usual rubbish start, followed by a frantic period of overtaking as I tried to work my way back through the field meant the top lads were miles away by the time I got my head into the race properly. I spent a couple of laps with Scott Wilson and Mike Wardle (rumours of my crashing on the off camber section due to not paying attention can just stay as rumours, as no-one saw…) before taking some advice being shouted from the pits and struck off on my own, to get a few laps at ‘full on’ pace done. By this point the top 5 were almost half a lap ahead of me, and I had no idea how far back on the person in front I was, but it didn’t matter too much as the course was great fun to just ride flat out. The usual 50 minutes went by before the ‘last lap’ bell rang out, which suited me fine (I sort of wish these races were longer so I had more time to chase everyone who buggers off at the start!) and I ended up 11th, 6 minutes down on the winner. Not too bad. Not great, but not too bad given the number of ‘big hitters’ who turned up to get some racing under their belts – I felt OK at race pace, which is good in the run up to next weekend’s National Champs. 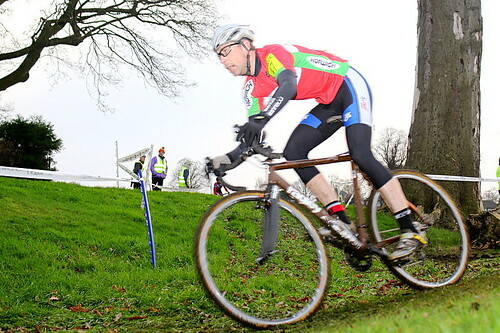 2 races left for this season now – the Nationals next weekend in Shrewsbury (eek) and the final round of the NWCCA League (which I now have a position in, thanks to Macc being the 9th counting race I’ve done) later in the month. The end is in sight and the washing machine’s looking happier by the day!